"Scott Frank and Mike Susits were very professional and..."
This Zionsville, IN homeowner, wanted to replace the roof on their beautiful two-story home. They called us for an estimate and were really impressed by our attention to detail so they moved forward and scheduled the roof replacement. We used Owens Corning duration shingle in the color Teak for this home. This shingle is extremely durable and gives this home great curb appeal. Before and after roof replacement in Zionsville Indiana. Roof It Forward has completed another roof replacement in Zionsville Indiana. This home is utilizing the Owens Corning Duration shingle in the color Estate Gray. This shingle is warranted for up to 130 Mph wind gusts, keeping your home safe and adding curb appeal to the entire neighborhood. Contact Roof It Forward for your next roofing project. Roof It Forward has completed another roof replacement in the town of Zionsville Indiana. This home is utilizing the Owens Corning Duration shingle in the color Driftwood. This shingle is warranted for up to 130 mph wind gusts due to it's built in sure nail technology strip. Contact Roof It Forward for your free inspection today. We had a hail storm. There is obvious damage to our fence and our roof above the porch. We would like the roof and siding inspected. Thanks. If your home has faded and worn siding and you want your Zionsville home to look fresh and new then contact ARAC Roof It Forward today for your siding installation and replacement needs. We can install vinyl siding on your home so you can have vibrant colors that will last decades that are easy to clean and can take a beating from the elements. We also install rigid foam insulation under the siding which will add to your Zionsville home's comfort while saving on energy bills. Contact ARAC Roof It Forward today, your trusted Zionsville, IN roofing & siding contractor! The Driftwood color of the Duration shingle is a perfect complement to this home's exterior. This shingle along with the shadow lines give the roof beautiful dimensions. 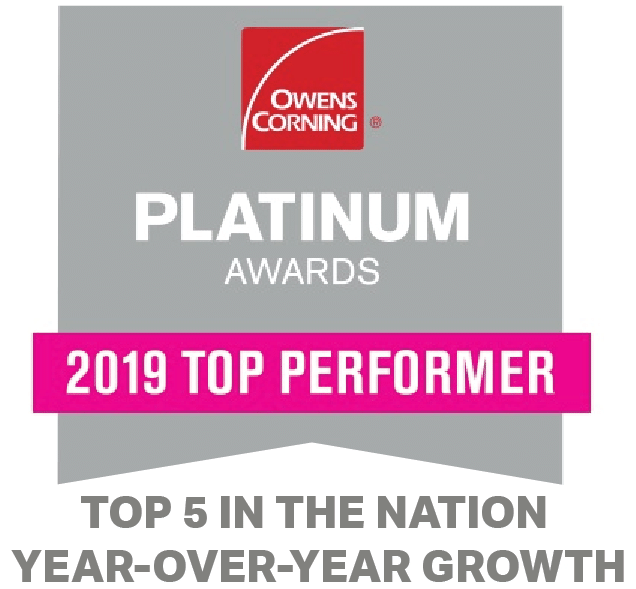 All Roof It Forward roofing projects are built using the Owens Corning roofing system where each component is designed to work in unison with one another.